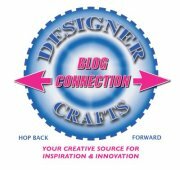 Some of you are following and taking part in the Designer Craft blog Connection hops every month. There is always lots of inspiration to find and great giveaways. For those of you who yet to discover this fabulous talented group of designers, this is a group of professional Arts & Crafts industry designers, who are linked together to support each other and industry manufacturers with one objective – to share their love of crafts with as many people as possible. We post projects and giveaways on the First Monday of each month. Look for this logo on your favorite craft blog then hop around for inspiration. You'll be glad you did!